Roger Federer has been pushed off Wimbledon’s Centre Court for the first time in three years. The eight-time champion is scheduled to play Wednesday’s quarterfinal against Kevin Anderson on No. 1 Court – his first match away from Wimbledon’s showcase venue since 2015. That year Federer beat Gilles Simon on No. 1 Court in the quarterfinals. The Swiss great has played every match on Centre Court since then, losing in the semifinals in 2016 and winning a record eighth title last year. But the All England Club opted to put Novak Djokovic’s match against Kei Nishikori and Rafael Nadal’s meeting with Juan Martin del Potro on Centre Court for Wednesday. That’s a decision that should please Djokovic, who told Serbian media on Monday that he was unhappy about playing all but one of his matches this year away from Centre Court. Julia Goerges advanced to her first Wimbledon semifinal with a 3-6, 7-5, 6-1 victory over 20th-seeded Kiki Bertens. Seven-time champion Serena Williams advanced to the Wimbledon semifinals with a 3-6, 6-3, 6-4 victory over Camila Giorgi of Italy. However, Williams lifted her intensity to level, before closing out the match to move a step closer to reclaiming the title she won in 2016. The 36-year-old Williams was absent from the All England Club in 2017 due to her pregnancy, and played her first Grand Slam since giving birth at the French Open last month when she reached fourth round. Williams, who hasn’t faced a player ranked inside the top 40 en route to the last four, will next face 13th-seeded Julia Goerges of Germany or 20th-seeded Kiki Bertens of the Netherlands. 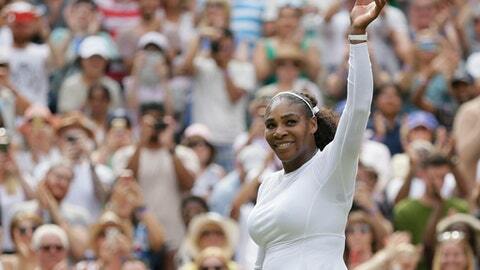 Serena Williams has won the second set to level her Wimbledon quarterfinal with Camila Giorgi. Williams lifted her intensity and avoided facing any break points as she secured one break of her own to take the set 6-3. Serena Williams has lost a set for the first time at this Wimbledon. Camila Giorgi of Italy leads seven-time champion Williams 6-3 on Centre Court in the quarterfinals. Giorgi overpowered Williams in the first set, hitting more winners and aces. Angelique Kerber converted her seventh match point to finally get past Daria Kasatkina 6-3, 7-5 and reach the Wimbledon semifinals for the third time. The No. 11 Kerber was the highest women’s seed to reach the quarterfinals; it’s the first time since Wimbledon began seeding players in the 1920s that none of the top 10 made it to this round. She will face No. 12 Jelena Ostapenko on Thursday for a berth in the final. Kerber is a former No. 1 and two-time major champion who was the runner-up at the All England Club two years ago and a semifinalist in 2012. She took advantage of the 14th-seeded Kasatkina’s 31 unforced errors, including seven double-faults. Still, Kerber had some trouble closing things out. She served for the victory at 5-4, but got broken. When she served for it a second time, she needed to navigate a 16-point game that included five deuces and all of those match points, until forcing a forehand error on the last. Jelena Ostapenko became the first Latvian woman to reach a Wimbledon semifinal with a 7-5, 6-4 victory over Dominika Cibulkova. Juan Martin del Potro advanced to the Wimbledon quarterfinals for the first time since 2013 by beating Gilles Simon 7-6 (1), 7-6 (5), 5-7, 7-6 (5). The fifth-seeded del Potro failed to convert four match points when serving at 5-4 in the fourth set, but maintained his composure to close out the contest with his first opportunity in the tiebreaker that followed. The only fourth-round contest to be carried over to Tuesday lasted 4 hours, 24 minutes, making it the longest men’s singles match of the tournament. It is the first time since he reached the Australian Open and French Open quarterfinals in 2012 that del Potro has qualified for the last eight at consecutive Grand Slams. The 2009 U.S. Open champion reached the semifinals at the All England Club in 2013, but four wrist surgeries – three on the left – almost made him retire. The Argentine next faces two-time champion Rafael Nadal, who has reached the Wimbledon quarterfinals for the first time since 2011. The women’s quarterfinals are underway at Wimbledon. Two-time Grand Slam champion Angelique Kerber is taking on Russian Daria Kasatkina on Centre Court. Kerber was the runner-up at the All England Club in 2016, while 14th-seeded Kasatkina is in the last eight for the first time. On No. 1 Court, 2017 French Open champion Jelena Ostapenko is in action against Dominika Cibulkova, who is playing her third Wimbledon quarterfinal. The only remaining fourth-round match has also resumed on No. 2 Court. Fifth-seeded Juan Martin del Potro led Gilles Simon 7-6 (1), 7-6 (5), 5-7 when play was suspended due to darkness on Monday. Later seven-time champion Serena Williams faces 52nd-ranked Camila Giorgi of Italy, and 13th-seeded Julia Goerges faces Kiki Bertens as the pair both play in their first Wimbledon quarterfinal. If he ever decides to stop playing tennis, Roger Federer may have a future in another sport. During his Wimbledon fourth-round victory over Adrian Mannarino on Monday, with the ball having already been called out, Federer played a stroke that was more akin to cricket than tennis. Whether it was a forward defensive shot or a back-foot cut, the eight-time champion’s technique impressed the International Cricket Council. After Wimbledon’s official Twitter account asked for a rating of Federer’s shot, the ICC replied with an updated version of their batting rankings, placing the Swiss at the same place he is seeded at Wimbledon – No. 1. Federer will resume his title defense on Wednesday when he faces eighth-seeded Kevin Anderson. Serena Williams is set to resume her quest for an eighth Wimbledon title when the women’s quarterfinals get underway at 1:00 p.m. on Tuesday. Her opponent is 52nd-ranked Camila Giorgi of Italy, who has never taken a set off Williams in their three previous meetings. The highest remaining seeded player in the women’s draw – No. 11 Angelique Kerber – faces Daria Kasatkina, who plays in her first Wimbledon quarterfinal. One of former Wimbledon quarterfinalists Dominika Cibulkova and 2017 French Open champion Jelena Ostapenko will reach the last four at the All England Club for the first time. The 13th-seeded Julia Goerges of Germany has reached her first Grand Slam quarterfinal and faces former French Open semifinalist Kiki Bertens, who has also reached the last eight at Wimbledon for the first time. Former U.S. Open champion Juan Martin del Potro and Gilles Simon also finish their fourth-round match suspended overnight because of darkness. Del Potro leads two sets to one.